While the concept quickly gained broad public support — and funding — most energy experts were skeptical of the solar roadways from the start. While the concept quickly gained broad public support — and funding — most energy experts were skeptical of the solar roadways from the start. Ars Technica first reported this week on the challenges facing this "oddly popular idea." In France, the world’s first solar roadway, dubbed WattWay, opened in 2016. The one-kilometer stretch of toughened PV panels, built by European road construction giant Colas, cost €5 million ($5.2 million) to build, and was expected to supply 280 megawatt-hours of energy annually, or about 767 kilowatt-hours per day. These metrics brought the cost of WattWay’s silicon resin-strengthened PV panels to €17 ($20) per kilowatt-hour, or about 13 times as much as the €1.30 ($1.53) per kilowatt-hour for comparative large-scale rooftop installations. But according to a January 2018 news report, WattWay only generated about 409 kilowatt-hours per day in the first year of operation, roughly half its expected daily output, further eroding its cost-effectiveness. The U.S. version of WattWay has been championed by a company called Solar Roadways. 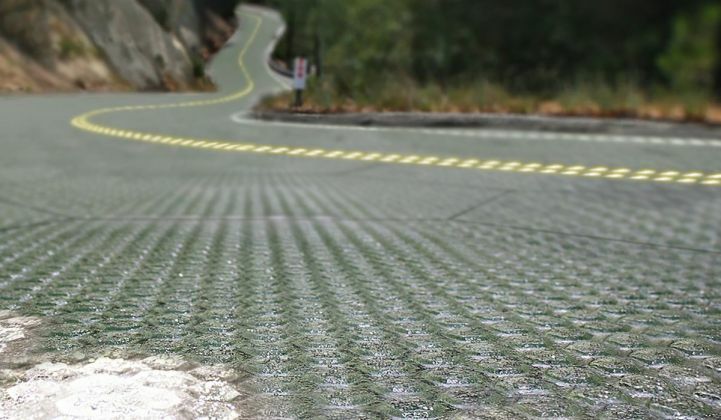 The Idaho-based husband-and-wife duo managed to raise $2.2 million in an Indiegogo campaign fed by a video entitled “Solar Freakin’ Roadways!” proclaiming the technology’s ability to light LEDs and melt snow with the energy it collects from the sun. More substantial support came in the form of a $100,000 U.S. Department of Transportation grant in 2009 to study the technology’s feasibility, along with a $50,000 GE Ecomagination grant in 2010 to further that work. Then, in 2011, DOT added a $750,000 grant to fund a second demonstration array with solar cells, LED lights, and a heating system built in. That project in Sandpoint, Idaho used 30 of the company’s SR3 panels, each capable of generating 48 watts, for a total of about 1,440 kilowatts. But the project’s 2016 ribbon-cutting revealed that many of the panels weren’t working, and further reports indicate that the panels haven’t generated nearly their stated nameplate capacity. Solar Roadways’ 2015 report to the DOT noted that its panels used about one-third of the electricity they generate to power their built-in LEDs, and that its heating elements could consume its entire generation capacity. It doesn’t mention that snow would be covering the panels at the moments they’d be expected to generate their heat. It also doesn’t mention that its Sandpoint installation would be sited in a public walking area, meaning that its panels haven’t yet faced the critical test for any would-be solar roadway: Can it be driven on? GTM emailed Solar Roadways for comment but did not receive a response by the time of publication. Eric Weaver, research engineer at the Federal Highway Administration, told Greentech Media in 2014 that the biggest unknown was safety. Asphalt — tar and gravel, essentially — is well suited for giving rubber tires the traction they need to stay safely on the road. “We can’t say that it would be safe for roadway vehicular traffic" to replace that asphalt with silicon-coated solar panels, he noted. DOT also hadn’t been able to field-test whether the panels could stand up under vehicular traffic, Weaver noted. "Further field-traffic evaluation is needed to determine safety and durability performance."